New York is home to the Apple Store. I’m not talking about any Apple Store, I’m talking about THE Apple Store. The Apple Store on 767 Fifth Avenue is Apple’s flagship store. It’s the store that all the major news media outlets go to film when Apple launches a new product. What makes this Apple Store special is a combination of unique design, it’s underground with a big glass cube above ground, and astronomical sales numbers. 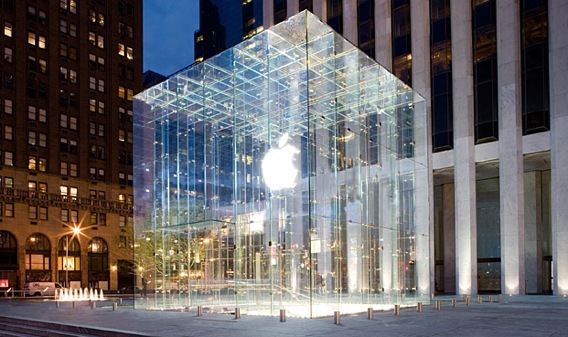 The 5th Avenue Apple Store is the most profitable store in the world. No other store from any industry can match its sale number. The Fifth Avenue store generates an unbelievable $30,000 of sales per square foot of space. Ten thousand square feet times $30,000 equals $300 million a year income. This store literally prints money for Apple. This is also the only Apple store that is open 24 hours a day. It never closes, not even on Christmas day. When something is making this much money, you keep it open! We showed up at the store at about 11PM and it was packed. Every Mac was being used by customers. The only Macs we could try out were the kiddie ones. Unlike a typical Apple Store, the Fifth Avenue store has a not one but two Genius Bars to answer your questions. In tradition of The Big Bang Theory, we decided to head over to the Apple Store to make fun of the geniuses. After this video, you’ll understand why Apple doesn’t allow people to take photos or videos in their stores.